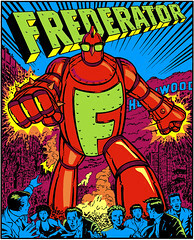 The Frederator Studios Blog: The Frederator Robot. Postcards, Series 5. We started forming Frederator Studios in 1997. Our friend Arlen Schumer, an amazing guy and better artist (partnered in the Dynamic Duo Studio with his wife Sherri Wolfgang), asked to design our announcement; he had a vision of a robot that crossed Gigantor and my bushy eyebrows and geeky glasses. Like everything he does, it was phenomenonly conceived and executed. Later, artist Eugene Mattos did some line drawings of different views, and, lo and behold, an icon was born.